Post sponsored by Crock-Pot® Brand/Mirum Shopper. See below for more details. If you look back through the archives of the site, you’ll notice a theme: I find recipes I like and then make slight changes to them all the time. In fact, I never settle with a recipe! Rather, I’m always exploring new ways to make an old recipe. As an example, this black bean chili is based on my favorite bulgur chili recipe. But it has a completely different flavor profile and happens to make a lovely slow cooker dish. The base of this chili is fairly straightforward. The toppings really make the chili, but that’s most chili recipes. The best part? 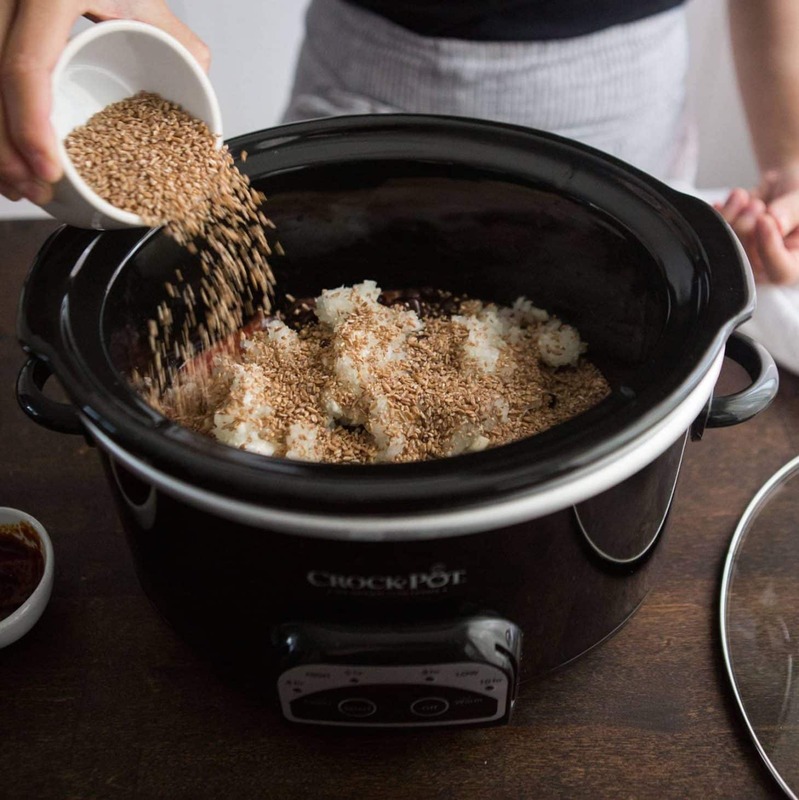 Once you put all the ingredients in the Crock-Pot® slow cooker, you can turn the slow cooker on in the morning and come back home to a delicious vegan dinner! 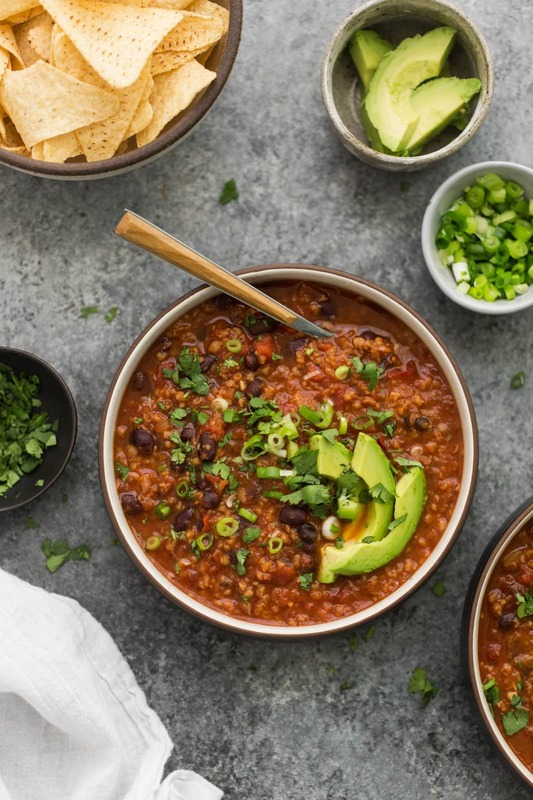 A hearty and filling vegetarian black bean chili that can easily be made in a slow cooker. Pulse the onion and garlic in a food processor until finely minced. 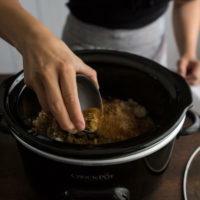 Transfer to Crock-Pot® slow cooker. 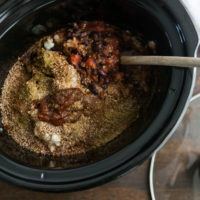 Add tomatoes, black beans, bulgur, chipotle chiles and adobo sauce, cumin, chili powder, smoked paprika, coriander, and salt into slow cooker. Pour in vegetable broth over other ingredients. Mix well and cover. 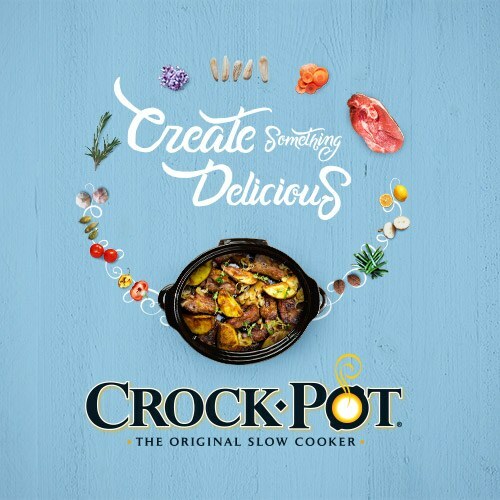 Set Crock-Pot® slow cooker to cook on high for 4 hours or low to cook for 6. When chili is thoroughly heated, spoon into serving bowls. Top with avocado, green onions and cilantro. 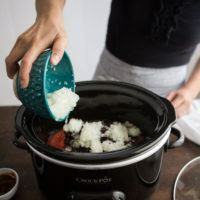 Tips & Tricks: If you prefer to not have the texture of the onions, pre cook them after processing with 1 tablespoon of olive oil (which you can do right in the slow cooker, just turn it on high). With the length of cooking time, you may want to add the beans in the last hour of cooking if you prefer less mushy beans. Chipotles in adobo get quite hot! If you prefer less heat, cut back to 1 chipotle chili. Also, if you have leftover chipotles in adobo sauce, freeze them in small portions to use in recipes later. 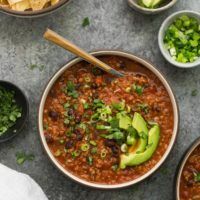 As mentioned above, this chili is a solid base and you can easily add ingredients depending on what you have in your kitchen. I like to use this as a base for more vegetables such as sweet potatoes and butternut squash in the fall and winter or sweet corn and zucchini in the summer. Chipotle powder: Chipotle powder would be a great substitution if you can’t find chipotles in adobo. Start with 1 tablespoon of chipotle powder and add more to taste. Greens: Add some greens to the chili! Chopped kale or collards can be added in the last 15-30 minutes. Or stir in baby spinach or chopped swiss chard and let sit before serving. Grains: Try the chili with freekeh or quinoa instead of bulgur. 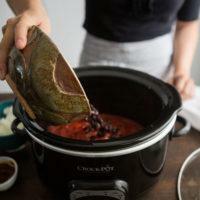 Disclosure: This recipe was created in partnership with Crock-Pot® Brand and Mirum Shopper. All thoughts and opinions are my own. It’s content like this that helps me keep this site running to provide the vegetarian recipes you see every week. My sister has really brought me round to veggie chilli. I will definitely give this a go ad pass it onto her. hi there – if i wanted to use dried black beans instead of canned, would i increase vegetable broth and cooking time? 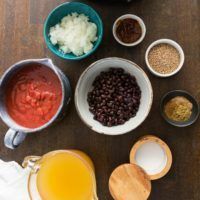 I would recommend cooking the black beans first as the tomatoes can keep the beans from cooking (you will end up with al dente beans). I am so happy that you are getting into the slow cooker! 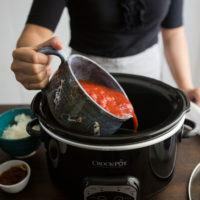 I rely on my two slow cookers heavily, making big batches of vegetarian meals on the weekend and then freezing them in single containers for lunches and dinners. I have this recipe in my crock pot right now for tonight’s dinner. Smells great. 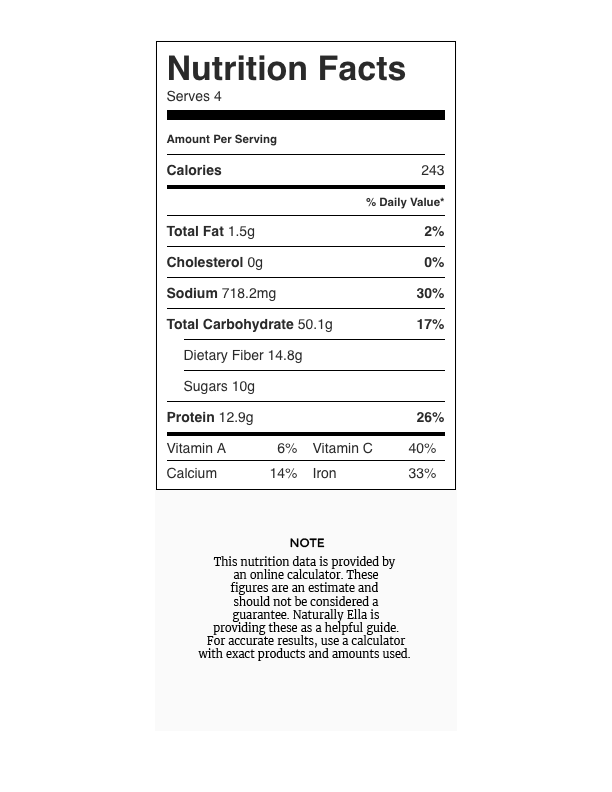 I couldn’t find chipotle in adobo OR chipotle powder- any other alternatives? I read that a mix of smoked paprika, chili powder and cayenne could work but I am not sure about proportions. Yeah, I would go with that and add quite a bit more chili powder (probably 1 to 2 tablespoons) and another teaspoon or so of smoked paprika. Most chipotle powder isn’t terribly spicy, so I would wait to add the cayenne until the end and go with small amounts 1/8 teaspoon +. Hope that helps! Another great recipe! Just made this and my meat loving husband helped himself to two bowls of this! The flavor is great, I used 3 chipotles because we like heat and used quinoa because I didn’t have bulgur and also added corn. Yum, definitely making again! Hello! 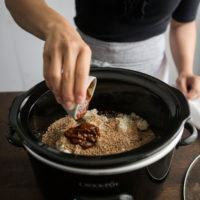 Do you think this recipe will still be good without the bulgar / any grain? Thank you! 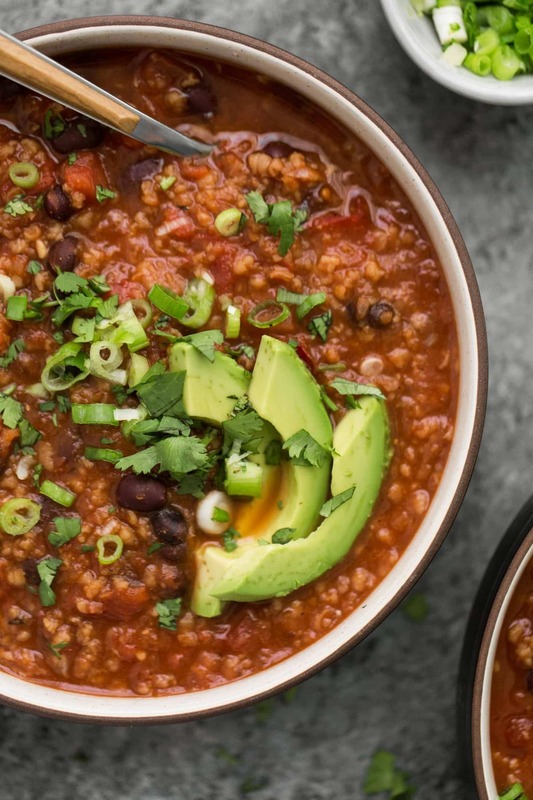 I do- I’ve done a mash-up of this bulgur chili and this black bean chili before. It’s delicious! Without the slow cooker- how long do you suggest cooking this? The bulgur cooks fairly quickly- I’d say about 20 to 25 minutes and the chili would be good! This looks good, I like the idea of using the bulgur as the ground beef texture. I will be trying as listed, but also think it might be good to experiment with quinoa in place of the bulgur. Thanks for sharing! I do have one comment – when I buy chipotles in adobo, the chipotles come while in the sauce. I will be putting them in the food processor to break them up first and would recommend others do this too… it wouldn’t turn out right if you didn’t, I just can’t see them breaking down on their own. But the recipe does not mention this.